With the snow melting and spring coming closer, more and more Grand Rapids commuters are seen cycling to work. Biking is becoming a more popular mode of transportation, with 32% of downtown residents biking or walking to work, according to the city’s website. Though Grand Rapids used to have a much higher rate of bicycle injuries and fatalities compared to the rest of Michigan, now, thanks to the efforts of the city, it has become a much safer place to bicycle. 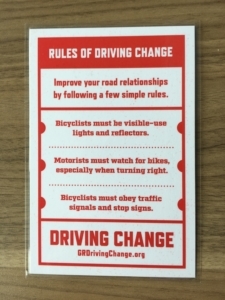 This is largely because of the “Driving Change” safety program, which focuses on bicycle and motorist safety. Started in 2015, it was created to combat the high rate of bicycle injuries and fatalities. The program was so successful it has become a “playbook” for other cities to follow, said Kristen Bennett, the Transportation Planning and Programs Supervisor for the Traffic Safety Division. The program included material on the laws for bicyclists and motorists, safety videos and tips. One of the videos explains the “five foot rule,” a city ordinance passed in 2015. It requires all motorists to wait to pass a bicyclist until they can do so with a five foot gap between their car and the biker; if they don’t do so, they risk pushing the vulnerable biker off the road. Recently, Traffic Safety Division with Grand Rapids Police Department (GRPD) participated in a research study through the National Highway Traffic safety Administration, Bennett said. 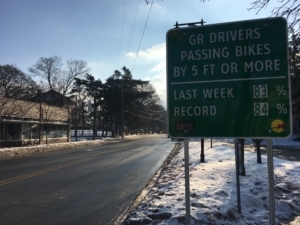 From May 2018 through February 2019, seven bikers and several GRPD officers rode their bikes around the city, with equipment to track the distance between each passing car and the biker. The city put up signs using the data in several spots throughout the city. “GR drivers passing bikers by 5 ft or more,” read the signs, with the percentage of drivers from last week and the record. This April, the city will be implementing the first Bicycle Action Plan, Bennett said. 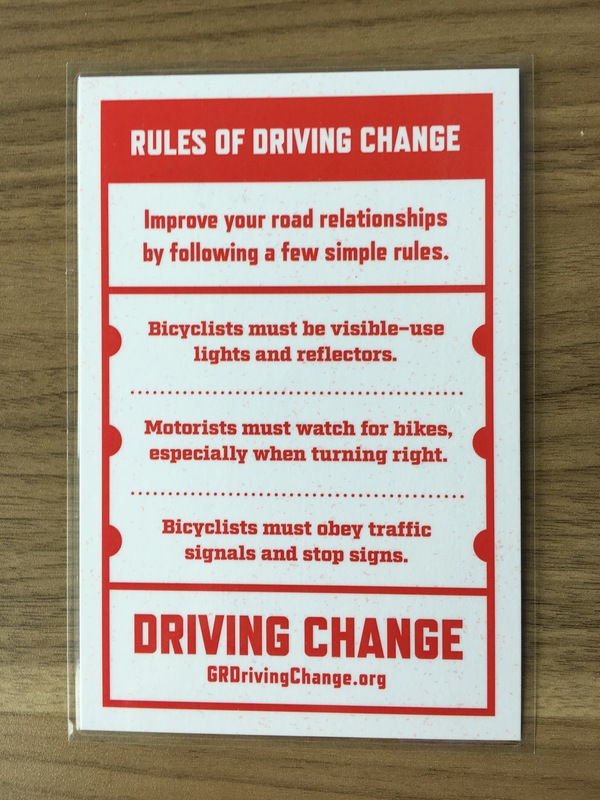 According to the city’s website, the plan lays out how to make biking safer and easier in Grand Rapids; deeply affected by public input, it gives recommendations for policy, programs and biking facilities. The city is also partnered with the Greater Grand Rapids Biking Coalition (GGRBC), an organization advocating for and educating on bike safety. “One of our goals is to make the place as bicycle friendly and safe as possible,” said Tom Bulten, Board Chair of the organization, which was started in 2009. Their biggest program is their “Smart Cycling” course. The course uses curriculum from the League of American Bicyclists, Bulten said. Each course, which can be taken all in one day or over a couple of weeks, has six different sections, including three classroom courses, a “skills and drills” class, and a road test. Both the city and GGRBC encourage bikers to stay on the road. “A bicycle rider might often or occasionally hear someone yelling out their window ‘get on the sidewalk, you belong on the sidewalk!’ that’s not really correct,” Bulten said. Instead, bikes are safer on the road; and bikers should be careful to follow all road rules, and be as predictable as possible, while motorists should treat them like slower, smaller cars. Bulten compared it to a car driver having to slow down and waiting to safely pass a USPS truck. The city is working to make roads easier and safer for bikers to use. “Staff also continues to make physical improvements for bicycling along with street resurfacing and reconstruction projects, including proposed new bicycle lanes on parts of Alger, Madison, Eastern and Hall with upcoming street resurfacing projects,” Bennett said. She explained improvements are also often piggybacked onto other street improvements. “We recently changed the existing striped bicycle lanes on Century Avenue between Pleasant and Sheridan (Franklin) to a separated two-way bikeway on the east side of Century with a major water line replacement project,” she said. With all these improvements, Grand Rapids has become a relatively safe place for bikers. Brown started biking to work eight years ago, when he lived in San Francisco. At the time, he did so because he didn’t have a car, but it was also the easiest form of transportation in a city like San Francisco: he didn’t have to worry about parking, making connections for public transportation, and was often beating traffic. He continued doing so when he moved to Grand Rapids. He explained he bikes to work the two or three days he goes into the office, although he drives if the weather is too bad. An “ecosystem” of biker organizations has emerged in Grand Rapids. Organizations like the Boston Square Community Bikes and The Spoke Folks will help residents build and fix their bikes. Bike repair stations have also started to pop up throughout the city. Bulten believes the risks for not biking are worse than biking. There are so many other benefits to biking, too. Owning and maintaining a car can cost seven to ten thousand dollars a year, he said, and so only owning a bike saves a lot of money. Bulten told the story of an acquaintance of his, a “professional millennial” who gets around by bike, who was able to use the money he saved to buy a house — “That’s kind of a nice trade off,” he joked. The impact on your neighbors can be huge. Air pollution stemming from a lot of vehicles can negatively impact those with asthma, and other vulnerable populations. Biking also helps reduce automobile congestion, Bulten said, by getting more cars off the road. “When you build neighborhoods in cities so that they’re walkable, and conducive to biking, they’re pleasant places, they’re happier places to live in,” Bulten said. On a larger scale, perhaps biking is key to solving major issues.